The Monroe City Police Department is charged with the responsibility of enforcing the laws of the City and State and providing for the safety and security of Monroe City’s citizens and businesses. You may contact the Police by coming to the Police Station located across from the City Hall building at 300 North Main Street in Monroe City, Missouri, from 8:00 a.m. to 4:00 p.m. You may also call the Police Department at (573) 735-4431. If no answer, call (573) 735-4411. The 911 emergency dispatcher in Paris, Missouri will answer. You may request that they radio the Police Officer on duty if you need assistance. If you have a critical situation in which the Police Department or other Emergency Service Personnel are needed immediately, call 911. 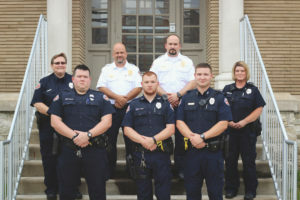 The Monroe City Police Department is a member of the Northeast Missouri Narcotics Task Force.